Tranel will continue her work in the Guadalupe Mountains. Lisa Tranel devotes her research to studying that slow rise, and what it does to the surface of a mountain. 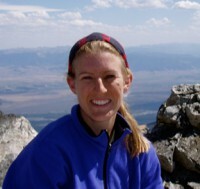 An assistant professor of geology, Tranel will return to the Guadalupe Mountains in Texas to study the connection between mountain uplift and erosion. The work is part of a $50,000, two-year grant Tranel received from the American Chemical Society’s Petroleum Research Fund. Part of her work will explore erosion rates in the basins and if deep-mantle convection makes an impact on the erosion and sediment accumulation. On this trip, Tranel’s team will camp at the Guadalupe National Park and collect samples and document surface features across a two-mile section of the mountains. “We’ll be hiking each day to the sites, so we need to stay near the collection locations. Camping in Dog Canyon will give us quick access, but keep us away from the basin that might flood if there are heavy rains,” said Tranel. The same undergraduate students will be studying the area through the University’s Geographic Information System (GIS). “Before they even set foot on the mountain, they will be creating computer models to study elevation data,” said Tranel. Overall, Tranel hopes the research will offer insights for future geologists. “We all build on each other’s knowledge to answer the questions about the Earth’s processes,” she said. Perhaps during her travels, Tranel will uncover a new flavor in Mother Nature’s recipe.